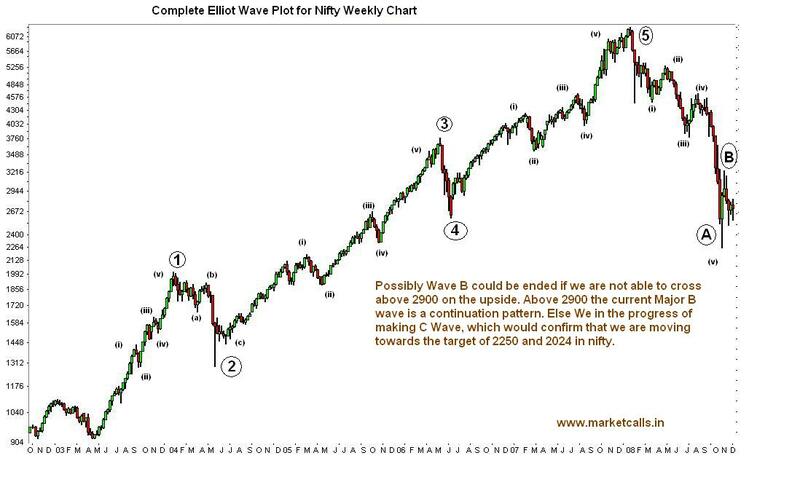 Chart Shown here is the Complete Elliot Wave interpretation for the Nifty Weekly Charts.Where the Major Bull Market Waves(implusive) are represented my 1,2,3,4,5. And the Major Bear market waves(corrective waves) are represented by A,B,C waves. By going thro the chart Possibly Wave B could be ended if we are not able to cross above 2900 on the upside. Above 2900 the current Major B wave is a continuation pattern. targetting 3250 and 3450 on the upside. Else We in the progress of making C Wave, which would confirm if nifty is able to close below 2500 targets of 2250 and 2024 in nifty. For the Past 10 sessions nifty is in a confusion and trading between this rangebound seesion facing resistance at 2800 on closing basis and 2860 on the extreme upper side. So Clearly it is confirmed that the day nifty crosses 2900, decisively nifty is moving towards the confirmed target of 3250 and 3450 where exactly the 200day weekly moving average comes. And on the other case if nifty is not able to makeup 2900 one could definitely conclude on his own that we are towards a strong downtrend. People could ask me why American market is bouncing back but why we are not??? The answer is the all the world market are strongly govern and stritly binded to Elliot Waves.